29 May 2018 --- Coca-Cola has launched its first alcoholic drink, a lemon flavored alcopop, in Japan, in a bid to tap into new markets and consumers, appealing particularly at the growing market of young female drinkers. In a global first for the US drinks giant, three fizzy lemon drinks went on sale on earlier this week. FoodIngredientsFirst initially reported on the launch when it was first announced in March this year. Described by the company as “unique” in the company's 126-year history, the three drinks range from 3 percent to 8 percent alcohol. In keeping with the company's tradition, the recipe is closely guarded, but the beverages are modeled on the country's popular Chu-Hi drinks, usually a mix of local spirit and a range of fruit flavors. 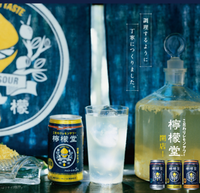 Chu-Hi – an abbreviation for shochu highball – has been marketed as an alternative to beer, proving especially popular with female drinkers in Asia. The most popular flavors are strong citrus ones such as grapefruit or lemon, the latter one being the taste Coca-Cola now wants a share of. Coca-Cola says there are no current plans to bring the new drinks range to markets outside of Japan. Garduño also noted that the company would probably sell its alcoholic drinks only in Japan, because of the “unique and special qualities” of the domestic market. Sales of soft drinks are in decline worldwide as young people become more health conscious, cutting down on sugar consumption and governments are cracking down on sugar taxes in a bid to combat obesity. Alcopop beverages boomed in Europe and the UK in the 1990s with the likes of Smirnoff Ice and Bacardi Breezer becoming fashionable with younger consumers. However, there were concerns that they encouraged young people to drink more alcohol because of the similarities between soft drinks and the alcopops. Coca-Cola has also branched out into water, coffee and tea to plug the sales shortfall. Earlier this year, FoodIngredientsFirst reported that Coca-Cola had enjoyed a 25 percent growth for Sprite in the Netherlands.